Not only first time fishing in Mexico…BUT FIRST TIME FISHING IN SALT WATER! Rich Pomeroy from the Sacramento CA area had a spectacular week with a variety of fish including his first marlin, dorado, pargo and this cherry wahoo! Nice way to kick it on your bachelor party! 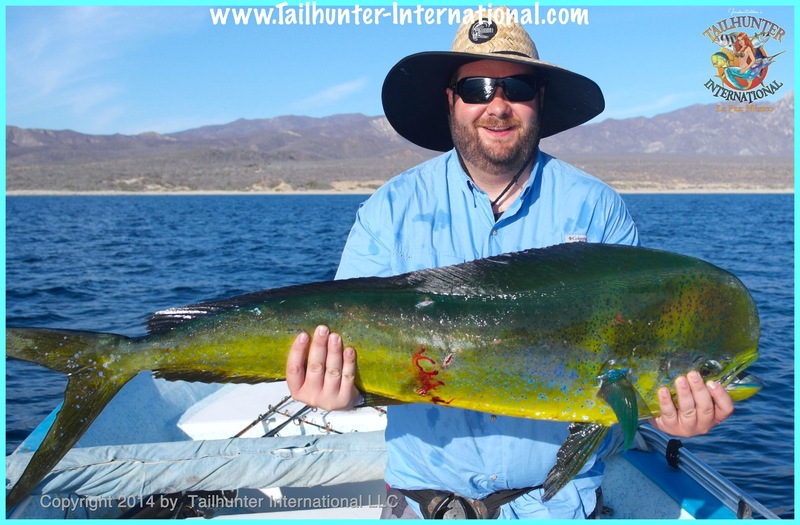 Rich Drehsen from Camarillo CA was on his bachelor party here in La Paz and spent a few day on the water with us and shows off a trophy bull dorado just off the beach near Boca de Alamo near Bahia de Los Muertos. No doubt a trophy! But, this is one of the larger cabrilla we’ve seen so far this year and Rick Pope dropped the hammer on this bad boy near Espirito Santo Island north of La Paz! We cooked up a bunch of it at our Tailhunter Restaurant! Rick was on a roll this week. He was even catching sizeable pargo on the docks behind La Concha Beach Resort at night! Stan Yung and Captain Archangel had a productive day! 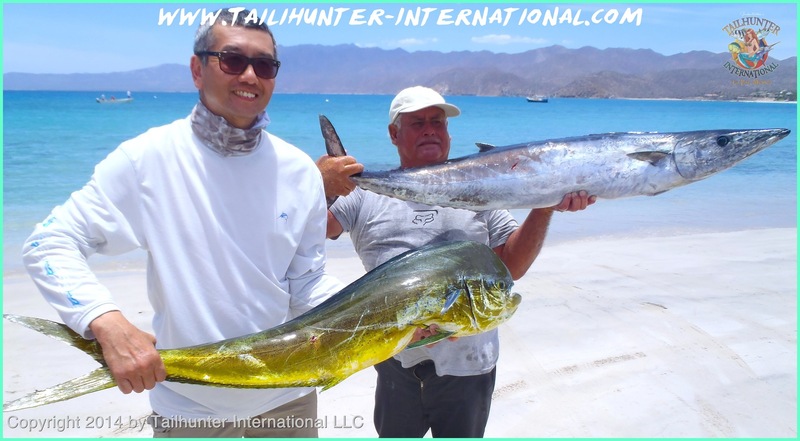 Take a look at the nice wahoo and dorado while on the beach at Bahia de Los Muertos! The quality of the dorado definitely improved this week with some nice bulls in the box like this brightly colored bull caught by our amigo from Diamond Bar CA Bill Hsu! 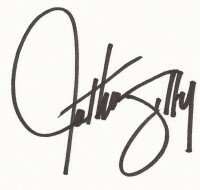 He’s shy! 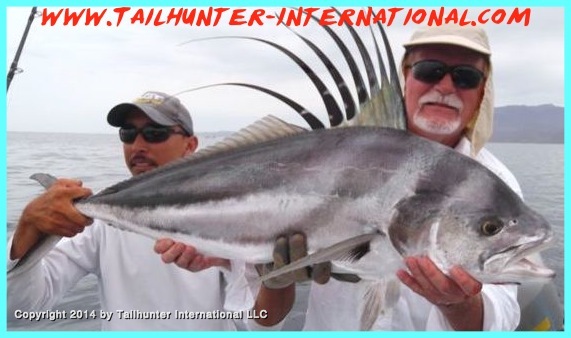 But Randy from Canada is hiding somewhere behind the comb of this 40 pound roosterfish taken off the rocks near Punta Perrico with Captain Pancho! The fish was released and Randy is smiling back there…somewhere! A colorful lineup rogues gallery! Rich, Chris, Ron and Ed did a nice number on dorado and pose on the beach at Bahia de Los Muertos! All are from Camarillo CA on Rich’s bachelor party! Big smiles as Captain Rogelio with our Tailhunter La Paz fleet helps Ken Errair from Oxnard CA who came down with his son, Cody, to spend a few days fishing and scuba diving with us. Arroyo Grande CA in the house! Mike Davis has been with us many times, but this is the first time he’s joined by his wife, Colleen who turned into quite a trooper and holds up some of their dorado catch with Captain Archangel. Roy Stenzel from the mountain area near Auburn CA caught and released this nice roosterfish with Captain Pancho during the week! Roosters are still here, although the emergence of dorado took some of the pressure off the roosterfish! 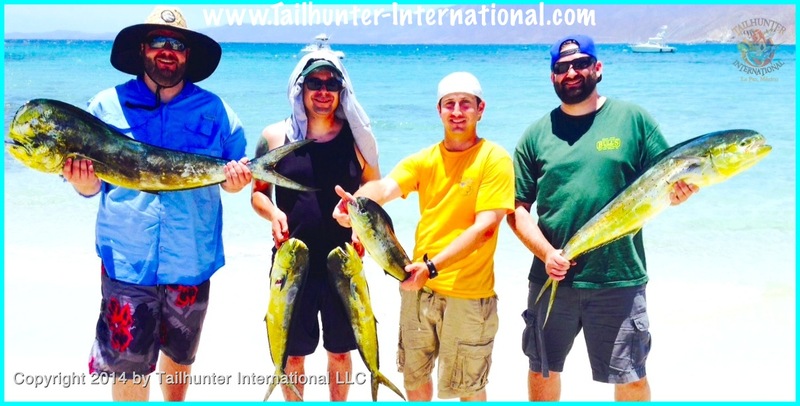 Rick Pope and Rich Pomeroy with two of the many fish and species they caught while fishing 4 days with us! No arguing over the quality of these mahi mahi! Captain Jorge and Ed Drehsen hold a nice pair on the beach. DORADO FINALLY FIRE IT UP AS WATERS WARM UP TOO! Well, we seem to have dodged a major bullet this week. Hurricane Amanda that formed up way south of us was watched intently all week. Not only would it have been the first “named” storm f of the year, but more importantly, it would have been a doozy. The weather folks say it would have been the strongest recorded hurricane ever for form up this early in the year. The Category 5 blaster registered winds of up to 170 miles per hour and regular winds over 150 mph! If it had made landfall, it would have torn up some real estate! Fortunately, Amanda spun out and went off west into the Pacific Ocean and left us only with some cloudy skies…a few big rain drops…and actually very flat calm seas that didn’t even have a ripple on them! Not sure how much it had to do with the fishing, but we sure had a pretty nice week of fishing! 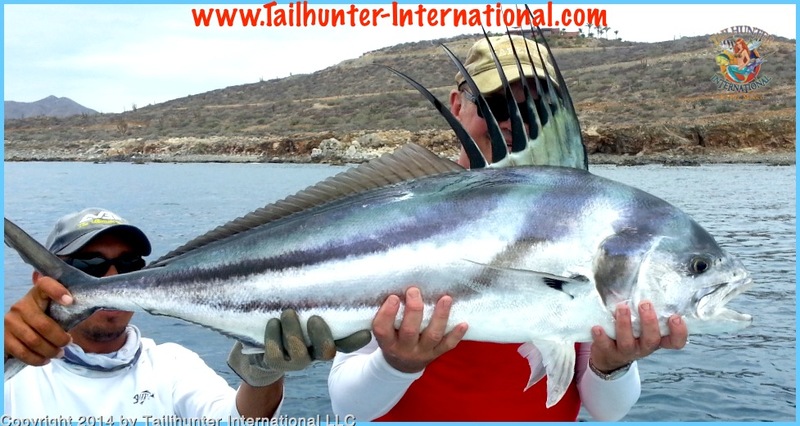 Early in the week, we again had some sweet big rooster fish around our Las Arenas areas. 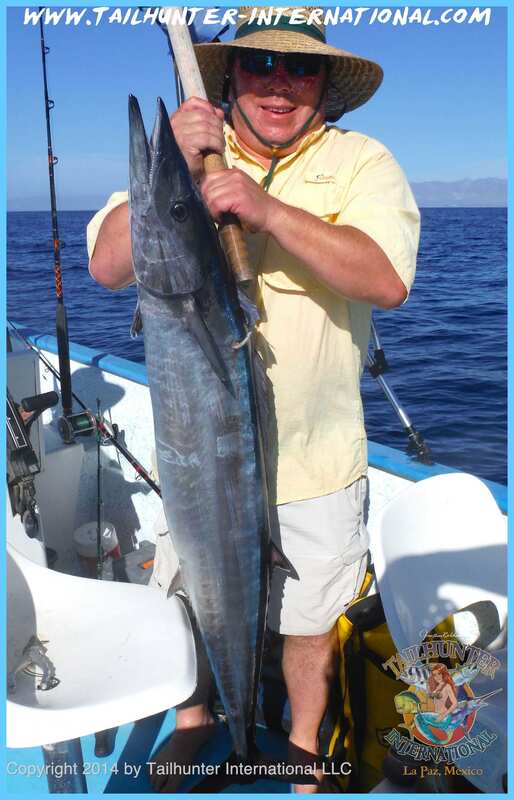 Las Arenas also produced some regular wahoo up to 45 pounds, pargo, cabrilla, sierra as well as jack crevalle and some huge big bonito. 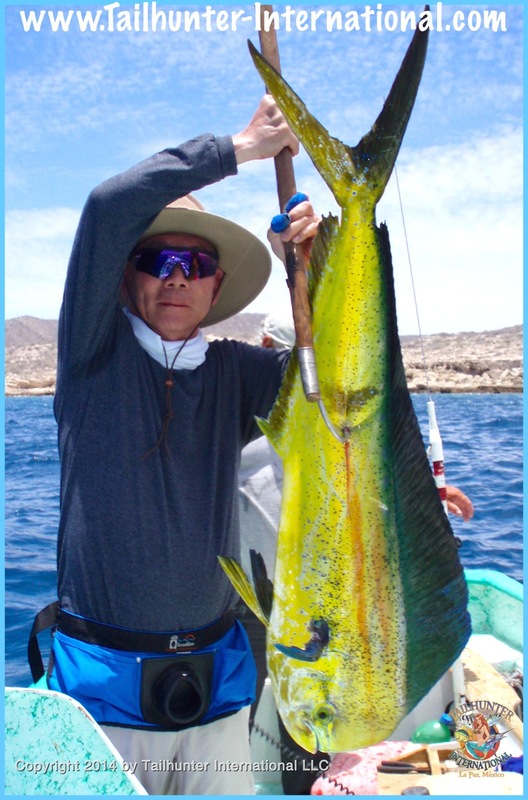 But, the more remarkable thing was that the dorado roared to life for our La Paz anglers and pangas. Towards the end of the week we were getting limits or near limits of fish up to 35 or 40 pounds and I would have to admit that the numbers were deceiving because our captains were coming back telling us that the clients lost more fish than they caught! For example a panga might come back with 3 fish, but I would find out from the clients or our captain that they “farmed” 4, 5, 7, even 10 fish” Every day was different. Some better than others, but overall, it was a marked difference from previous weeks. But, that’s all fun! Lots of action is a good thing! Even the flyfishers are having a better time of it. 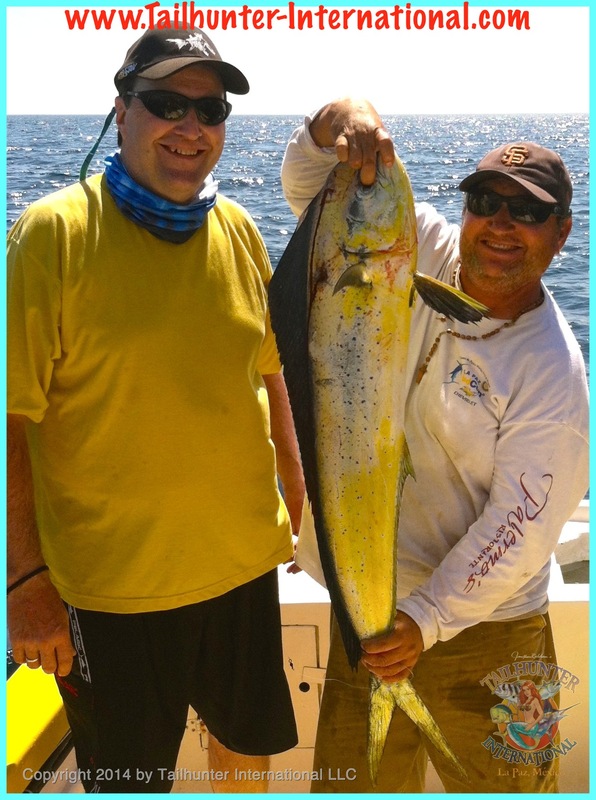 They’ve had a tough time because of a lack of bait during the early season, but they even got into the dorado this week as well although roosters on the fly have proved to be a bit more difficult. 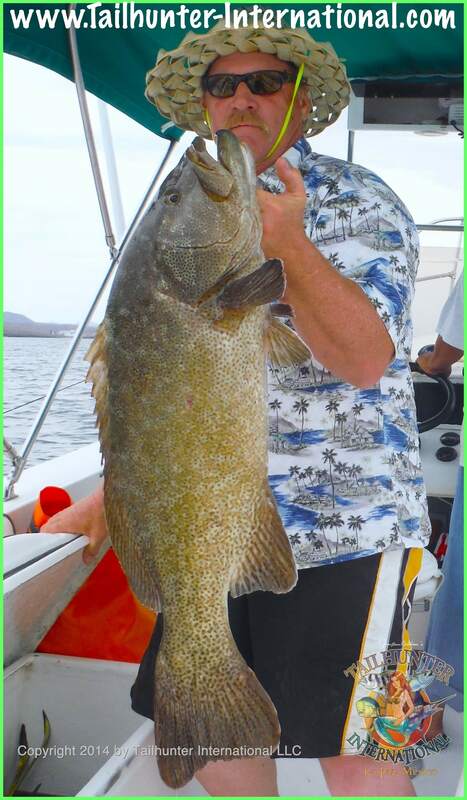 We had one amigo who got 25 dorado caught-and-released on the flyrod on a single day. Also remarkable was the fact that we’ve been lamenting the lack of bait all season. However, this week there stacks upon stacks of bait around La Paz beaches…mackerel…caballitos…huge sardines…ballyhoo! The bait was thick! In fact, there was so much bait in the bay for several days that we had dorado swimming in the shallows inside the marina and harbor areas within casting distance of the hotels. We also have clients who were beach fishing in the late afternoons hooking some big pargo and cabrilla and several marlin were seen inside the bay as well! Not sure if this will last or we’re finally kicking into summer, but I will tell you that the water temps edged up a few degrees this week and alot of the green plankton water burned of leaving us with some gorgeous blue water like the kind you see in postcards! We even got out to the islands to sneak away for a few hours of scuba diving, paddle-boarding and kayaking! 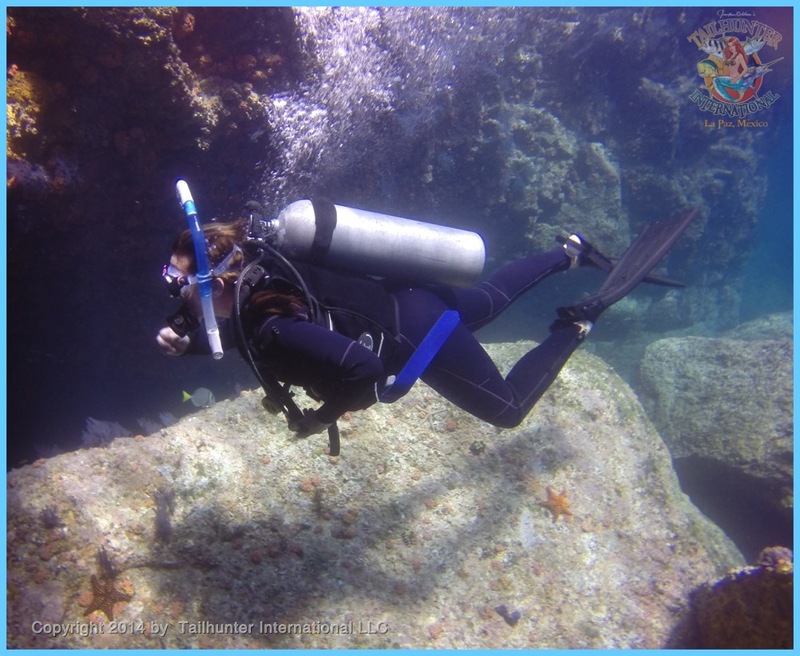 Jill got to put a few more dives under her belt with her new certification! Jill kicking along about 40 feet down in 82 degree water at Isolotes north of La Concha! CHECK OUT THE VIDEOS FROM THE ISLAND…JILL DIVING…PLAYFUL SEALIONS…BAJA TORQUOISE BAY! 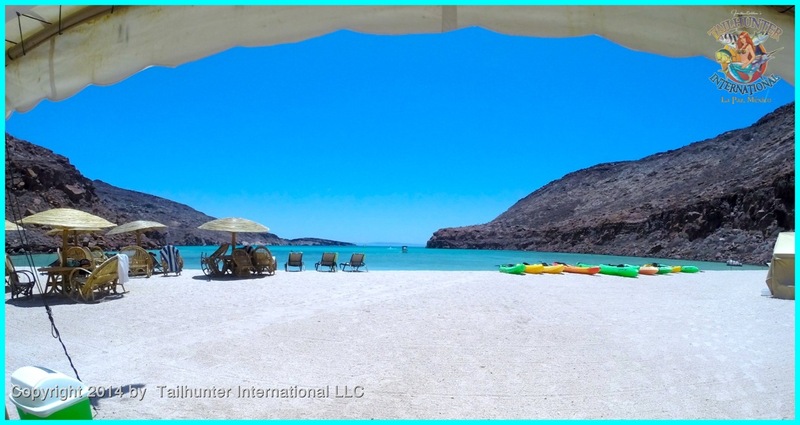 The Beach at Ensenada Grande on Espirito Santo Island run by our amigos at Fun Baja and a great place to kick it for the afternoon after diving and snorkeling. With kayaks, paddle boards, palapas, lounges and a great little lunch kitchen, it’s hard to beat!